China has witnessed a religious revival over the past four decades, in particular with a significant increase in Christian believers. The number of Chinese Protestants has grown by an average of 10 percent annually since 1979. By some estimates, China is on track to have the world’s largest population of Christians by 2030. Though the rise of Christianity presents the officially atheist Chinese Communist Party (CCP) with challenges, it also provides new options for improving services, such as health care and education, for an increasingly demanding public. The government recently launched a series of initiatives to further regulate, and at times restrict, Christian adherents. What is the history of Christianity in China? Early waves of Christianity began with the arrival of Italian Jesuit missionary Matteo Ricci in China in the late sixteenth and early seventeenth centuries. The first Protestant missionary to China, Robert Morrison, traveled there in 1807 on behalf of the London Missionary Society and translated the Bible [PDF] into Mandarin. In the mid-nineteenth century, Christianity became a mobilizing political force: Hong Xiuquan developed a Christian-influenced ideology to mount the Taiping Rebellion (1850–1864) against the Qing Dynasty, attracting missionaries and revolutionaries alike. The rebels amassed control over more than one-third of Chinese territory and established a rival political order, known as the Heavenly Kingdom. The ensuing civil war killed an estimated twenty million people. The establishment of the People’s Republic of China in 1949 resulted in wide-scale religious repression in mainland China. In keeping with its Marxist roots, the CCP declared itself atheist. “Maoist Thought,” a sinification of Marxism-Leninism that placed the future of the Chinese revolution in the hands of the rural peasants, was the dominant ideology. This was especially true at the height of the Cultural Revolution (1966–1976), when places of worship were demolished, closed, or reappropriated and religious practices were banned. Mao Zedong’s death and his successor Deng Xiaoping’s subsequent reforms reopened China to the outside world, in turn granting greater freedoms to Chinese citizens. A surge in Christian adherents can be traced from the period beginning in the early 1980s. Today, China’s Christian population encompasses a range of citizens [PDF], from all ages, from the countryside and urban centers, including students and professionals. China is also the world’s largest producer of Bibles. In 2016, the Amity Printing Company, a joint venture between the Amity Foundation, a Chinese nongovernmental organization, and the United Bible Societies, printed its 150 millionth Bible, with one third of those coming between 2013 and 2016. The company prints Bibles and other Christian book products in many languages for both domestic and international markets. However, while the government exercises a certain tolerance of religious practices, religious freedom is still constrained and regulated. What is China’s policy on religious practice? The CCP officially recognizes five religions: Buddhism, Catholicism, Daoism, Islam, and Protestantism. The activities of state-sanctioned religious organizations are regulated by the State Administration for Religious Affairs (SARA), which manages all aspects of religious life, including religious leadership appointments, selection of clergy, and interpretation of doctrine. Christianity in China is overseen by three major entities: the Three-Self Patriotic Movement, the China Christian Council, and the Chinese Patriotic Catholic Association. To register as a state-sanctioned Christian organization, religious leaders must receive training to “adapt” doctrine to government and CCP thinking. China does not differentiate among Christian denominations beyond Catholicism and Protestantism. Underground house churches exist parallel to state-sanctioned Christian churches. Spirituality and religious practice have long been embedded in traditional Chinese culture, says Sara Cook, Freedom House’s senior research analyst for East Asia. Article 36 of the Chinese constitution protects freedom of religion. Yet that protection is limited to so-called “normal religious activities,” explicitly stating that “no one may make use of religion to engage in activities that disrupt public order, impair the health of citizens or interfere with the education system of the state.” These provisions provide authorities with flexibility when determining which religious practices are consistent with party policy and which fall outside the party-state’s guidelines. The constitutional provision goes on to specify that religious bodies cannot be subject to foreign control. Underground house churches exist parallel to state-sanctioned Christian churches. These congregations operate outside the guidelines of the government, and their regulation by party authorities is largely determined by local leaders. Much like official Christian organizations, their membership is also growing across regions and demographics, according to surveys by independent polling groups. Fenggang Yang, of Purdue University’s Center on Religion and Chinese Society, estimates that there are between 93 million and 115 million Protestants in China, with fewer than 30 million attending officially registered churches. Other Christian organizations estimate a higher number still. Estimates of Catholic faithful in China range between ten million and twelve million. However, the Vatican and Beijing have not had formal diplomatic ties since Mao severed them in 1951. Since August 2014, Pope Francis has sought to thaw relations with China, which had strained further amid a dispute over who has the authority to appoint bishops. Typically, the authority to appoint senior Catholic clergy resides with the pope, following consultations among other high members of the Church. Beijing, however, has appointed a number of bishops without the approval of the papacy; moreover, a few Chinese bishops, primarily within underground house churches, have been self-nominated and self-approved. In 2018, the two sides reached a provisional agreement that paved the way for a new process by which the Vatican would confirm candidates who have been put forth by Beijing. While it does not formally restore diplomatic relations, the agreement signals a possible change in Chinese policy on foreign interference in state religious affairs. The deal has stirred mixed feelings among Catholics within and outside China. Some favor the rapprochement, while others fear that the Vatican is effectively bowing to the Chinese government. Why has the number of Christians surged? Social scientists have observed the rise of a spiritual vacuum, following decades of unprecedented economic growth. Modern China has emerged as a wealthier and more educated society with renewed interest in religion. Consequently, experts say that as the CCP’s ideology loses public traction, Christian churches, official and unofficial, appear to be filling some of this void. Believers are not only searching for meaning in their own lives but also for the future of their country as China adapts to a rapidly changing economy and society. Protestantism “appeals to Chinese traditions of ritual and community,” according to French Jesuit and China scholar Benoit Vermander. Moreover, experts say Chinese Christians are also attracted to the faith’s sense of fellowship, comprehensive moral system, organized structure, and solidarity as part of an international movement. Additionally, harsh repression of more popular traditional Chinese religions [PDF]—especially during the Cultural Revolution—reduced the influence of Buddhism and Taoism and opened the door for greater Christian expansion. Protestantism has become a dynamic part of China’s religious landscape. Christians in China are predominantly Protestant, drawn to the religion’s emphasis on egalitarianism and spiritual community within the church, says Purdue’s Yang. The sense of fellowship among Chinese Christians is attractive compared to the hierarchal structures of other religious and social organizations, Yang adds. It is also possible that more Chinese may choose Christianity over other faiths, such as Tibetan Buddhism, Islam, or Falun Gong, because Christianity is more tolerated and is potentially a safer option in China, says Freedom House’s Cook. Christian religious practice resurfaced after the end of the Cultural Revolution and has been gaining ground in Chinese society. The number of Christians in the early 1980s was estimated at about six million. Today, estimates vary widely: The government tallies twenty-nine million Christian adherents, while outside organizations have placed their estimates substantially higher. In 2010, the Pew Research Center calculated sixty-eight million Christians in China, or approximately 5 percent of the country’s population. Other independent estimates suggest somewhere between 100 and 130 million. Purdue’s Yang projected that if “modest” growth rates are sustained, China could have as many as 160 million Christians by 2025 and 247 million by 2030. Much of the discrepancy between official government numbers in China and expert estimates can be attributed to Beijing’s nonrecognition of Christians engaged in religious activity outside of state-sanctioned religious organizations. Experts reference two historical events as drivers of China’s religious awakening. Deng Xiaoping’s opening and reform policy changes triggered a religious revival in the 1980s, with Christianity first spreading in house churches formed in rural areas. The second major event was the crackdown on democracy activists in Tiananmen Square in 1989. This marked a major turning point for urban communities; intellectuals who had hoped to promote democratic ideals as an alternative to Maoist thought pivoted to religious practice—to Daoism, Chinese Buddhism, and, eventually, Christianity. On the economic front, Beijing shed traditional Maoist policies and has pursued a market economy. As a result, social structures in rural and urban areas were dissolved. Religion entered the fold as a new form of social organization, mostly through conversion. 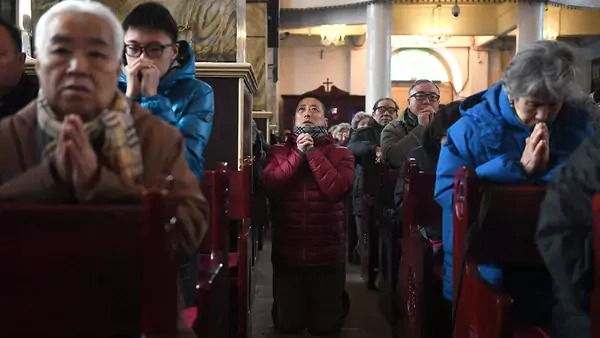 As China works to strike a balance between what are anticipated to be difficult economic structural reforms and adapting to the changing needs of Chinese citizens, experts say that the Christian revival is likely to continue. “Whatever the precise number, the fact is that Protestantism has become a dynamic part of China’s religious landscape, especially in its biggest cities and among its best-educated people,” writes Ian Johnson, author of The Souls of China: The Return of Religion After Mao. How has the government reacted to the surge in Christians? Christians have faced growing repression in recent years. Over the past twenty-five years, China ranked tenth as a country where it is most difficult and dangerous to practice Christianity, according to Open Doors, a U.S.-based Christian nonprofit that tracks the persecution of Christians worldwide. Repression campaigns ebb and flow. While house and underground churches traditionally faced the brunt of persecution, under Xi’s leadership state-sanctioned churches have been targeted as well. Recent repression efforts target both house and state-sanctioned churches through the harassment and detention of Christian believers, blocking entry to sites of worship, interrupting gatherings, dismantling crosses, demolishing churches, and disbanding congregations. For example, party officials in the eastern coastal province of Zhejiang’s city of Wenzhou, known for its large Christian population, have ordered the removal of hundreds of crosses and demolition of dozens of churches that allegedly violated construction regulations, though several had received prior approval from local officials. Moreover, Zhejiang officials announced that the party would enforce a ban on religious belief among party members to prevent the “penetration of Western hostile forces.” In central Henan Province, local government and police officials have taken similar actions, carrying out raids on some churches without warrants and razing others. Other provinces with large Christian populations, including Anhui and Jiangsu, have also undergone crackdowns. Faith-based organizations are perceived as one of the most serious threats to the Communist party. The CCP identifies religious groups as potential threats to national security, social harmony, and core interests. Ye Xiaowen, former SARA director, argued in 1996 that “religion became a weapon in the hands of dissidents for inciting the masses and creating political disturbances.” Though the state’s regulation of religious practice tends to be cyclical—revival, repression, and back again—religion in China remains inherently political. Purdue’s Yang wrote that “faith-based organizations are perceived as one of the most serious threats to the Communist party” in his 2012 book, Religion in China: Survival and Revival under Communist Rule. Catholicism faces moderate persecution and Protestantism faces a high degree of persecution in China, according to a 2017 Freedom House special report on religion revival in China [PDF]. Today, an increasing number of human rights advocates and lawyers are Christian adherents, stoking party suspicions that Christianity could be a unifying force to challenge its authority. While religious leaders and practitioners may have no intention of undermining the party, the very perception of a threat by party leaders sets the stage for possible confrontation between churches and the state. Implementation of religious policy is largely left to local party officials. Some have repressed religious groups, including high-profile cases such as the crackdowns on Zhejiang church crosses and Beijing’s Shouwang Church, the demolition of a megachurch in Shanxi Province, and the imposition of lengthy prison sentences on members of an unregistered church in Yunnan Province. In other places, though, leaders have been more tolerant of Christian religious activities. A leading priority for local officials is ensuring good party performance, which prizes social stability. At the top level, Beijing has signaled attempts to inject party influence into Christian ideology. In August 2014, Beijing announced its bid to nationalize Christianity at a conference entitled the “Sinicization of Christianity.” According to state media, SARA director Wang Zuoan said that Christian faith should first and foremost be compatible with the country’s path of socialism and that “the construction of Chinese Christian theology should adapt to China’s national condition and integrate with Chinese culture.” To complement this initiative, Beijing has enhanced efforts to bring unregistered churches and their members under the larger umbrella of the state-sanctioned authorities, though there are still significant regulatory obstacles that make the process of registering burdensome [PDF]. If successful, SARA would have greater oversight over the Chinese Christian leaders, activities, and beliefs of adherents. More traditional Chinese beliefs, such as Chinese Buddhism and Confucianism, have also been championed by Beijing to promote a harmonious society. Some experts suggest that this push indicates a move by authorities to buffer against the spread of Christianity. The central Chinese government has also revised its religious regulations intended to boost national security and protect against the spread of extremism and foreign infiltration. The new regulations, which took effect in early February 2018, include explicit bans on unregistered groups teaching about religion and increased oversight on religious gatherings and financing. As the Chinese government and party attempt to wield more control over religion, “the tensions between church growth and suppressive political and media environments is likely to intensify,” says Li (Mary) Ma, author of Surviving the State, Remaking the Church: A Sociological Portrait of Christians in Mainland China. Marisa McPherson contributed to this report. Ian Johnson paints a portrait of China’s religious revival in his 2017 book The Souls of China: The Return of Religion After Mao. China Aid’s 2016 annual report tracks the persecution of Christians and churches in mainland China. Sociologist Rodney Stark and Xiuhua Wang explore the rise of Christianity in China in their 2015 book A Star in the East: The Rise of Christianity in China. Fenggang Yang’s 2012 book Religion in China: Survival and Revival Under Communist Rule explores the Chinese government’s treatment of religious practice under the leadership of the CCP. While solar panels, electric buses, and wind turbines emerge, fossil fuel usage and demand for commodities continue to degrade Latin America’s environment. This week: Facial recognition raises ethical concerns; the EU takes steps to combat terrorism online; the UK regulates child safety online; DNS hijacking in the Middle East North Africa region; Facebook bans white supremacy groups; Iranian hacker group targeted.